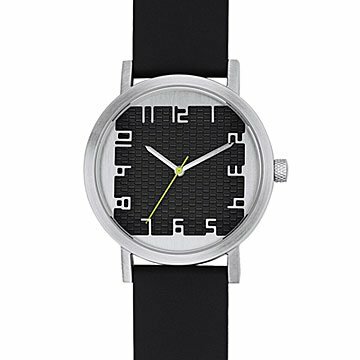 This watch features iconic numerals surrounding a square aperture. Sometimes, distinctive design really is about fitting a square peg in round hole. From the Japanese word for window, the Mado watch features iconic numerals designed by Michael Graves surrounding a square aperture onto a textured architectural background. This boldly modern, unisex design will compliment any wrist with its classic interplay of geometry. Brushed stainless steel bezel with a black silicone band. Made in China.